In addition to hands-on science, science scholars also attend lectures about careers in science. I recently had the pleasure of participating in a science symposium at St. Jude Children’s Research Hospital. 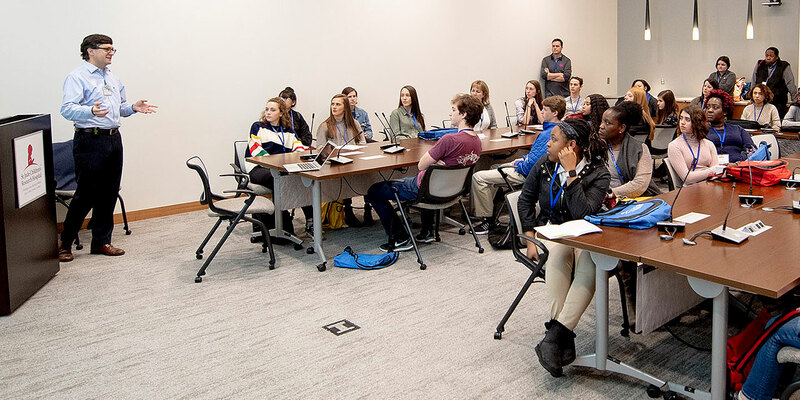 Science Scholars of Tomorrow, an annual event, brings selected high school students to the St. Jude campus to learn more about scientific research, medicine and career exploration. Not only did I learn about the day-to-day science and medicine at St. Jude, I also learned something significant about myself. A big reason for attending Science Scholars was to learn more about a career in medicine — and if that was something I wanted. Many kids think you have to get a medical degree or have a degree in one of the natural sciences to work in the medical field. I know that’s true for me — at least was. Medicine is diverse – I wasn’t aware how different degrees and specializations play into medicine. But Science Scholars changed that – One presentation from a St. Jude employee who had a computer science degree talked about monitoring and maintaining computer equipment and technology. In addition, we rotated through presentations from engineers, computational biologists and many others who play a big role in helping St. Jude function day-to-day. Research and medicine go together. Science Scholars showed me the importance of research in medicine and caring for sick people. It helped me understand the different jobs and people behind the medicine. You can play a role just as important as a doctor, one of the people who diligently explores and investigates cancerous cells and potential new treatments. Science Scholars also showed me the different fields within the sciences; the specialties, like structural biology. It showed me how broad science is, and how all the different specialties and fields work together and then take shape – like it’s so many things while just being one thing all at the same time. I was fascinated, honestly. St. Jude needs people with diverse scientific backgrounds. This way, many different specialties and people contribute to the discussion, advancement and understanding of our world. I learned some amazing things at Science Scholars, but I learned something very important about myself. I learned that maybe science and medicine isn’t for me. I was raised in an environment where I was always celebrated for being smart, and was always pushed toward being a doctor. From that, I had convinced myself that was what I wanted to do, and denied other career aspirations. Of course, I don’t blame my family for that — they only wanted the best for me, something that I am forever grateful for. However, it took the last few months of my senior year to come to the realization that maybe medicine isn’t for me and that I should stop pretending it was. Science Scholars was one of the catalysts in that chain of events. The labs and research were interesting, but it didn’t call out to me — not like a career would, something to be passionate and excited for. Science Scholars showed me something I don’t see every day. I know more about science and medicine now, and have a better understanding and respect for them. This day was the fork in the road for me and probably many others who were invited. Some of us choose this new path of science and research, and others don’t. I’m not sure I would have made this decision if I hadn’t been shown so many different aspects of St. Jude. Others, including future Science Scholars, may go in thinking research and medicine is for them — and at the end of the day, they will be able to make a better-informed decision about their path in life. Maybe things change, and I consider coming back to science and medicine — no matter what that decision is, Science Scholars had a big part in me making it. Aaron Hervey is a student at Middle College High School and recently attended the Science Scholars of Tomorrow Symposium at St. Jude.